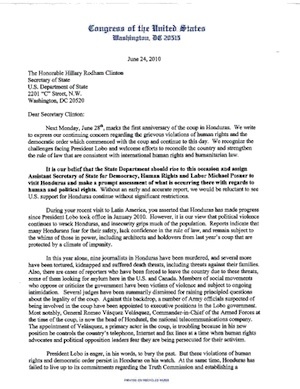 Twenty-seven members of the U.S. House of Representatives signed and sent to Secretary of State Hillary Clinton a letter (PDF) expressing their concern regarding the human rights violations and violations to the democratic order in Honduras that continue one year after the June 28, 2009 coup ousted President Manuel Zelaya. Below is the full-text of the letter. You can download the PDF here. It is our belief that the State Department should rise to this occasion and assign Assistant Secretary of State for Democracy, Human Rights and Labor Michael Posner to visit Honduras and make a prompt assessment of what is occurring there with regards to human and political rights. Without an early and accurate report, we would be reluctant to see U.S. support for Honduras continue without significant restrictions.